Your team has developed audience personas and knows which topics and keywords resonate with your audience. The content promotion plan is done and the KPIs are set. You begin assigning the content marketing work. And then you hit a wall: You can’t find enough quality content creators to join the team. I hit that wall, then figured out a solution – a process to build content teams in a short time with relative ease. To avoid the wall – or to break through it – consider these tricks and tools. Does posting opportunities to job boards consume most of your hiring time? The time-consuming component of the hiring process is vetting and interviewing the applicants. The average interview process in the United States runs 23.8 days, according to Glassdoor research. And that’s where online tools can help speed up the process and help you find quality content creators to implement your content marketing strategy. Vervoe is an interview-automation tool my company used to craft an interview process and workflow for hiring. Applicants use Vervoe to go through each step, responding to pre-set questions we selected through a drag-and-drop function. The program also creates a dashboard so we can see where each candidate is in the process. If you don’t want to go through all the applicants’ answers manually, you can have Vervoe grade the answers based on preferred answers you provided earlier. Candidates making the grade (whatever you determine that to be) are advanced to the next stage in the interview process. 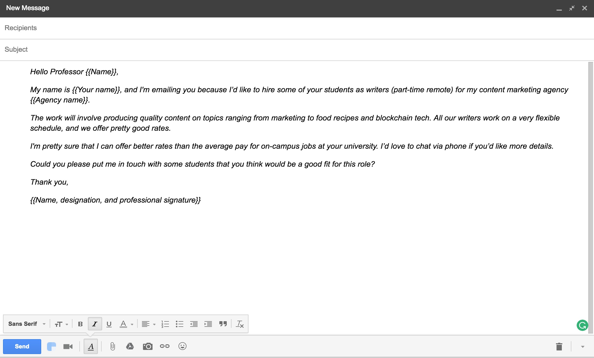 With both Vervoe and Typeform, once a candidate completes the interview, you receive an email notification. And the automation-assisted process doesn’t have to stop there. To streamline the output of results entered through the Typeform application, you can integrate it with Zapier, an automated workflow service, and connect it to your Google account. The output is a Google Sheets document, which makes the review process of completed interviews easier. 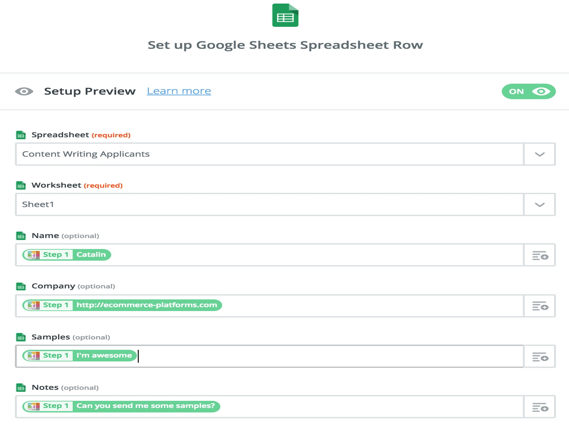 After you set up the “Zap,” all new Typeform entries from applicants are automatically populated to the Google Sheet. We first send applicants an initial questionnaire link (from Vervoe or Typeform) to quickly ascertain whether they’re qualified for the role. TIP: We eliminate any applicant (rows on the Google Sheet) who hasn’t included samples – that’s a red flag. If they pass that step with convincing answers, we send a link to a final questionnaire to see how passionate the applicants are about writing in our target niche, and to get an idea on how well they can write by asking them to provide links to their best content. 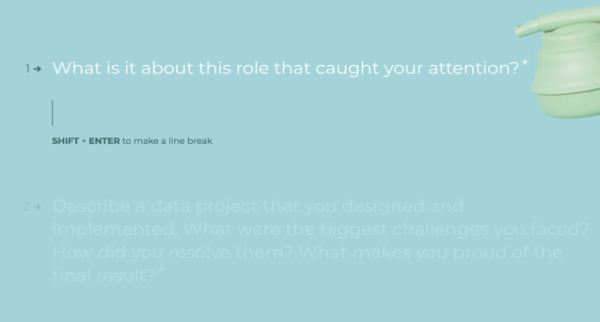 Vervoe makes setting up interview questionnaires super easy with publicly available scripts. 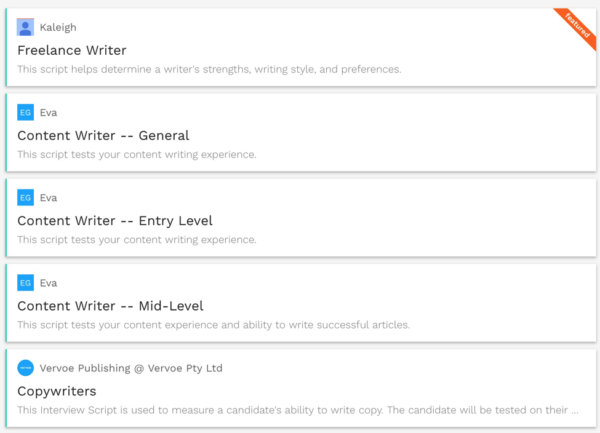 This screenshot shows prepopulated script options that exist for freelance writers, content writers (general, entry level, and mid-level), and copywriters. You can plug and play whichever scripts are most relevant to the position you want someone to fill. Vervoe also offers an optional step, which is particularly helpful if the applicant doesn’t have experience in your particular niche. The system can require the applicant to spot-write a 500-word piece on a niche topic that warrants actionable content and submit it via the form. This is crucial because it helps us easily get an idea of how well applicants who don’t have a good portfolio can write. In the automated interview process, we assign tasks to see how well they follow processes and provide our standard operating procedure (SOP) document as a resource. For example, we will ask them to optimize for a target keyword. When reviewing their responses, we will see whether they followed the on-page optimization checklist provided within the SOP. Candidates who pass the automated rounds of interviews receive an email inviting them to an in-person interview or call. By automating the initial steps in vetting candidates, we have reduced our hiring time by about 70%. 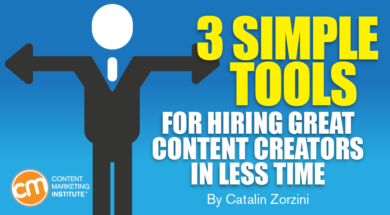 Now that you have an automated process for hiring quality content creators on your team, your search for short-term or per-project content team members can be shortened too. It’s a problem many content marketing teams have – finding freelance or contract writers who can write well and whose fees fit within the available budget. Many companies or agencies frequently use platforms like Upwork, Freelancer, Fiverr, or others when they have project-specific content writing needs. But that process often falls apart. While they may be able to find good writers with time, it takes a lot of time to weed through the volume of the applicants pitching for the opportunity. If that’s your predicament, you should be looking in a place that’s less crowded – and using the automated interview system described earlier. This is what we do: We hire students. Students usually will be native language speakers with considerable academic writing experience and they charge reasonable rates. They are attracted to the opportunity because they can build their portfolios and often are paid more than they can earn in a traditional on-campus job. We created a templated approach to the first steps of the process, reaching out to marketing and public relations professors at local universities. TIP: Don’t expect a single email to work. Professors usually will vet external companies before recommending them to their students. Interested students are asked to follow a similar automated process through the Vervoe or Typeform interview forms we use to do full-time hiring. We’ve hired students for a number of client projects quickly this way. Because the students have great research skills, they helped create some of our best guides and comparison posts. If you’ve got your own unique hiring hack, let’s chat in the comments. Automating the initial interview process is just one way to scale your content marketing. Discover how to scale (through automation and other tools) your entire content marketing program at the Intelligent Content Conference March 20-22 in Las Vegas. Register today. Catalin is the founder of Ecommerce Platforms and the editor-in-chief of Inspired Mag, an online magazine for designers. He loves blogging about his passions like matcha, bitcoin, and blockchain technology, and is an avid coder and designer. You can reach out to him on Twitter and Linkedin.